Butternut Squash and Boursin Tarte Soleil. Around this time of year, after the rolling food coma that is generally the holidays, I know it can be challenging to drum up new and inspired ideas for things to nibble on. And although the health-conscious part of me would much rather tuck into a hearty and healthy soup at this point, this doesn’t exactly fit the bill. Still, this tarte soleil is simple. 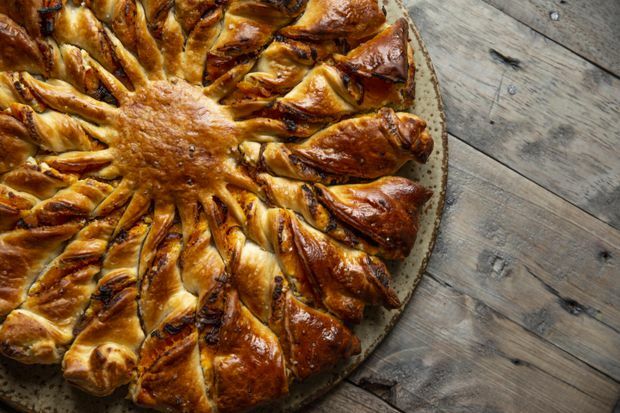 Two sheets of store-bought puff pastry, your choice of filling and a little main-d’oeuvre go a long way toward this fun, edible centrepiece. Surrounded by pickled things, a selection of local charcuterie and possibly even a cheese platter, and you’ve got the making of the first fine brunch of the year. I imagine the tarte soleil to be derived from more common puff pastry-based snack items, such as palmiers or bâtons. Adaptable as ever, it can be a vessel for just about anything savoury from tapenade, to ham and cheese, to roasted butternut squash and Boursin cheese as I have done here. When working with puff pastry, it is best to keep it as cool as possible. Working with chilled ingredients as well as implementing a quick rest in the fridge between each of the steps goes a long way to making your life and the construction and execution of this dish that much easier. Toss the butternut squash cubes with the olive oil, maple syrup, salt and pepper. Lay them out on a single layer across two-thirds of one side of the baking sheet. In the same bowl, mix the onions with any remaining seasoning before spreading them across the remaining one-third of the tray. Roast for 20 to 30 minutes until the butternut gets browned and becomes soft and mashable. The onions should be fully cooked and caramelized. Once removed from the oven, use the back of a fork to mash together the butternut pieces to form a rough purée. Cool the mash and the onions completely. Defrost the puff pastry according to the instructions on the box and then roll it out to 3 mm thick on a sheet of parchment paper. Place the largest round plate possible on the surface and cut around it using a pizza cutter or a knife in order to achieve a circle. Do the same with the second sheet of puff pastry. Place both in the fridge with parchment paper in between them for 5 to 10 minutes before proceeding. Using a spatula, spread the Boursin across the entire surface of the first sheet of pastry. Continue by spreading the butternut mash over that. Break up the roasted onions and sprinkle evenly across the surface. Cover with the second sheet of pastry centred over the top. Carefully slide and transfer the whole thing to a baking tray. Generously bush the top pastry with the egg wash. Place in the fridge for 20 to 30 minutes or until the pastry is once again nice and firm. Use a small glass to make a light imprint in the very centre of the top sheet of pastry. This is will help be your guide as you shape the “sun rays.” Using a knife, cut approximately 24 “rays” around the circle, cutting through all the layers from the edge of the indent in the centre, to the edge of the pastry circle. Carefully lift each ray and twist clockwise 3 to 4 times before placing back down on the parchment. Note: This step is infinitely easier when the pastry is cold! Bake in the oven for 20 to 30 minutes or until the pastry is crisp and turns a deep golden brown. Allow to cool for 5 minutes before serving or cool completely and then reheat for 5 to 10 minutes in a 350 F oven before serving.